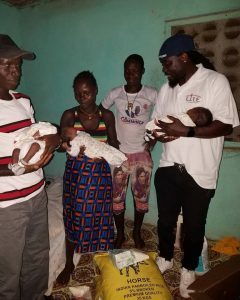 Liberian Woman Delivers quads! | LITE Saves L.I.T.E. ed her, one child died and three were left alive. Through our generous donors, LITE was able to give Pinky Joe and her family 6 months of food supplies and diapers. LITE has made it their personal mission to support Pinky Joe throughout the life of her children. She already had one 7 year old boy and now she has 2 boys and girl. Most Liberian girls have at least one child before the age of 19. She can feel handcuffed in poverty without a source of options and education on how to live a successful life. LIFE is committed to ensuring Pinky Joe and her children are a successful. Mr WordPress on Liberian Woman Delivers quads!